Lightning is a discharge of electrical energy resulting from the build-up of positive and negative charges within a thunderstorm. The flash or "bolt" of light usually occurs within clouds or between clouds and the ground. A bolt of lightning can reach temperatures approaching 50,000°F. On average, 89 people are killed each year by lightning strikes in the United States. Within Pennsylvania, the annual average number of thunder and lightning events a given area can expect ranges between 40-70 events per year (FEMA, 1997). Relatively more lightning flashes occur in southwestern Pennsylvania and in the Lehigh Valley than in other areas of the Commonwealth. 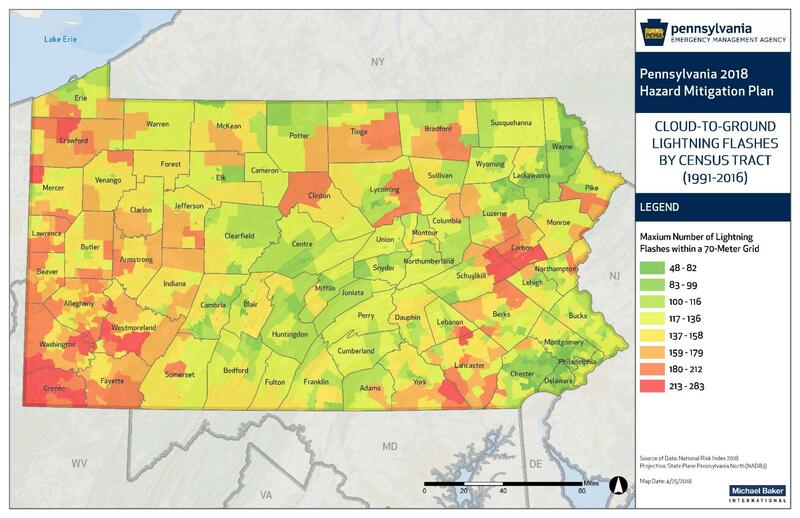 Eastern and southeastern Pennsylvania are at greater risk for death, injury, or damage to lightning than central and north-central sections of the Commonwealth due to higher population density. 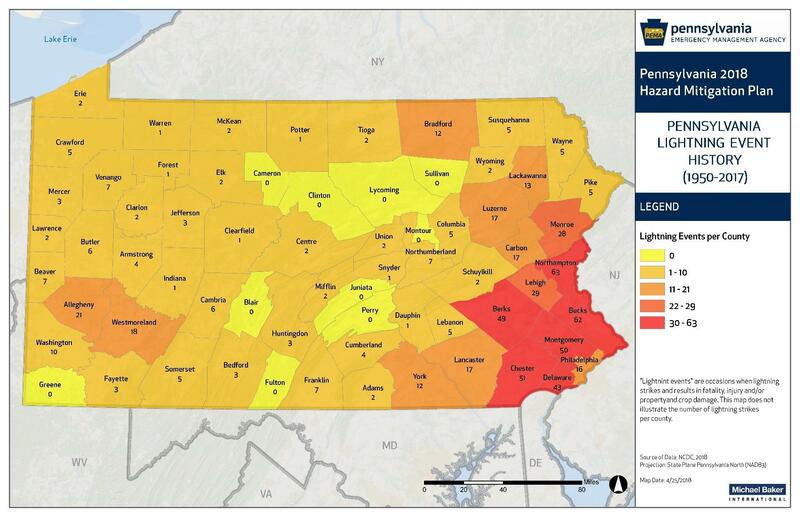 There were 657 lightning events in the 57 counties across Pennsylvania between 1950 and 2018 resulting in 30 deaths and 2,257 injuries. Northampton and Bucks Counties reported the most events with 63 and 62 events. The number of lightning events is influenced by the frequency of a severe thunderstorm occurrence. Therefore, potential future changes in climate and weather conditions may impact the future occurrences of lightning strikes, as according to the Pennsylvania Climate Impacts Assessment Update, thunderstorms are projected to increase in frequency. Cloud-to-ground lightning flashes by census tract, 1991-2016. Pennsylvania lightning event history, 1950-2018.